Soane over an office hand, Henry Hake Seward 1778-1848. The differences from drawing  lie in the design of the entrance (now preceded by three steps and with a different column) and the arrangement of the stair and vestibule/hall. 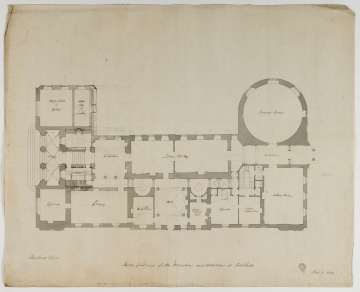 Soane has added some room labels (new are 'Cloister' and vaulting to the entrance) and amended the stairs. The enfilade plan along with the west-east service corridor remain unchanged.